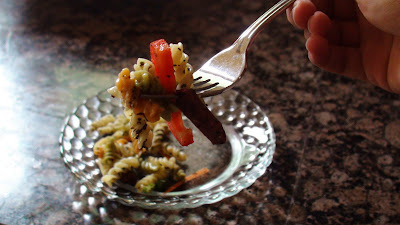 This week I have decided to make a vegetarian only meal of a colourful and delectable pasta salad! Perfect for a “Meatless Monday” or a nice and light summer meal. This recipe for pasta salad is absolutely amazing, not only is it very simple, and containing fresh vegetables but seriously, every single person who has tried this pasta salad has immediately fallen in love. When my friends come over they request this all the time! Whisk together all of the ingredients for the dressing in a bowl. Next, chop up all of the vegetables and add them to pasta. Toss and serve! Please note: This is an amazing school or work lunch. Throw it in a Tupperware and you’re good to go! « What’s something everybody should be able to bake? – Pound Cake! If it's not meat, then what is it? Certainly not a vegetable, that's for sure. I'm aware of the religious argument involving fish not being a meat, but other than that, how can you honestly think fish isn't a type of meat? It comes from an animal - one that has blood, bones, scales, reproduces, and so forth. Sorry, I'm trying my hardest to keep an open mind here because people are entitled to their own opinion but seriously, fish is meat. "If people all around the country, and the globe took part in meatless Mondays campaign not only would we be healthier but we would also be doing our part in saving the environment!" ... Fishing is detrimental to the environment. Just saying. "Anonymous" . . . username says it all. Just saying.